Lewis LaRosa , “Bloodshot & H.A.R.D. Corps: H.A.R.D. 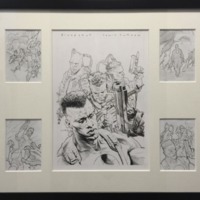 Corps #0 (2012) - Original Cover Art,” The Valiant Museum, accessed April 25, 2019, http://valiantmuseum.com/archive/items/show/33.